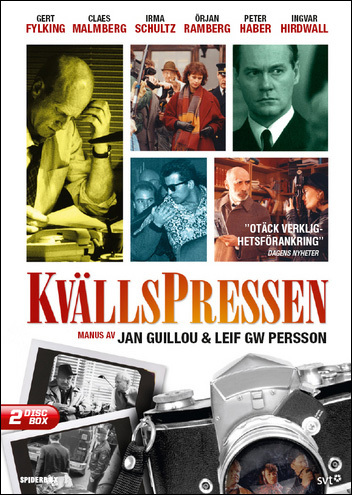 Kvällspressen, a Swedish TV series in six episodes, was about the fictional paper Evening Press and the journalists who worked at its editorial office in Stockholm. The series depicts the work on a fictional evening newspaper, and because the competitor is called "Bladet", it is not very difficult to figure out which newspaper the Evening Press should represent. The series has a large personal gallery, but as main characters one can count on the reporters Per Wennström (Gert Fylking) and Petra Hernberg (Irma Schultz); the experienced male and the Great Journalist award-winning star reporter who can do a little as he wants, and the female young up-and-coming writer who works a bit in reverse. It has some flaws here and there, but on the whole it is good. Well done and quite well-behaved and a little surprising that it did not go on.